Remember the day we went 36.1 mph? Especially in this snow-starved winter, February 23 at Jackson Hole was a day to remember. 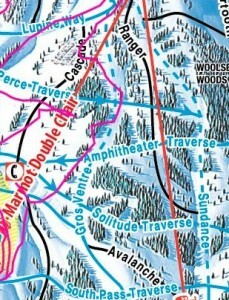 We took the Gondola up, then skied down the right side of Lupine Way, cut across Ampitheater, and then clipped the bottom of the woods across Tower Three Chute, Hoops Gap, and Thunder, before ducking under the Marmot chairlift and then taking a hard left turn to board it. The moral of the story is: smart customers remember. Not only can you use apps to record intricate details of your life, but you also can backup your precious memories in the cloud, protecting those 945 photographs you took of your son’s 1st birthday and the 147 times you sliced the ball instead of driving it 200 yards straight down the driving range. Nine years ago, when my 21-year-old was 12, we skied at Alta and I have vague memories of a wonderful time. Nine years from now, when my youngest son turns 21, I’ll be able to reminisce about February 23, 2012, the day we went 36.1 mph down Laramie Bowl. Posted on April 5, 2012 by Bruce Kasanoff. This entry was posted in Digital Sensors, Pervasive Memory and tagged app, fitness. Bookmark the permalink.